A wall that “retains” something, typically soil. So if you see a wall that on one side the soil is lower than the soil is on the other side, that is a retaining wall. It has to be designed to hold the soil back, otherwise it will tip over or “overturn”. There are many types of retaining walls, some are stand alone walls that function as part of landscaping. Others are parts of building, road or bridge infrastructure. 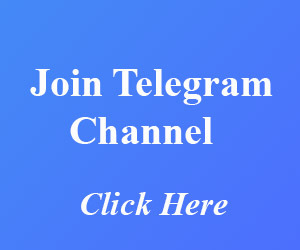 They are commonly constructed of cast in place concrete, masonry block walls or heavy timber. 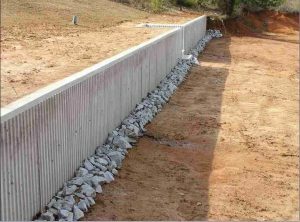 Concrete retaining walls commonly have integral footing which is used to resist the wall overturning. Block walls employ geo-textile fabrics that engage the retained soil to resist overturning. Timber walls typically use embedded vertical posts to resist overturning, or soil nails. 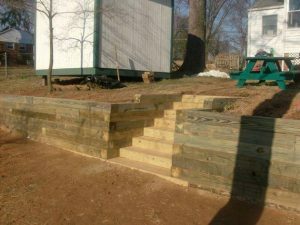 Depending on the height and complexity of the wall and soil condition, a retaining wall can be designed by an engineer or landscaper, or sometimes for simpler cases they can simply be constructed by rules of thumb. ← Which part of the beam has more Bending Moment? What does it mean by 95% compaction?